We want to alert you to the fact that Spark, your Service Provider, is making a change to their XTRA email system early next year and you have to take action by 30 November 2016 or risk losing data on your account. For a number of years now, Spark (previously Telecom NZ) have sub-contracted the management of their XTRA email system to yahoo.com in the USA. Throughout this time, your @xtra.co.nz email account has been hosted from the US and if you have ever used the browser email programme, you will have noticed Yahoo is mentioned all over the place. Without sharing the specific details, Spark have made it clear that their contract with Yahoo is being terminated and that they have decided to move all their customers’ email accounts back into New Zealand. Normally, this would be a simple technical issue for Spark to deal with and you wouldn’t even know it had happened except they have clearly run into a security-related hurdle! 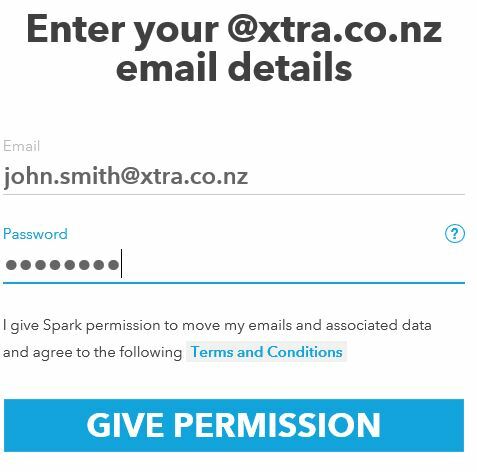 You, as the owner of the XTRA email account, MUST give your explicit permission for your account (data) to be migrated back to NZ. There’s nothing sinister about this and we would urge all our members to take action immediately and not leave things to the last minute. Spark are requesting that all their customers log on to their website at www.spark.co.nz/email and give their permission for the transfer. In order to achieve this you will have to have access to your XTRA email password. If you are one of our many Windows Live Mail users, you may not have had to use this password for a very long time so you will need to locate it in your files. Make sure that your XTRA email address is entered and not any other email address you may also use. Note: If you have several XTRA accounts linked to your Spark account (eg family accounts), you need to repeat this for every account. When you’re done, you will receive the following confirmation message. This is all you have to do and early next year your email service will be delivered from inside New Zealand (and you won’t even notice the change!). If you take no action, your account data may be lost or worse, access to your email may be suspended on that date! Spark will undoubtedly contact you directly (and by email) in the coming weeks/months and nag you until this is done. We recommend you take action immediately after which, hopefully, they will leave you alone! Spark are assuring their customers that if they give their permission, they will be quietly migrated to the New Zealand-based service with no obvious impact. Windows Live Mail (and any other client-based email program) as well as any phone or tablet-based access will all still work. We have no reason to think this won’t happen IF YOU GIVE PERMISSION! Any member who is nervous about doing this should come along to a How Do I…? Session at SeniorNet Kapiti early next Term and we can assist you to “Give Permission”. You will however need to bring along your email password otherwise we cannot guide you through the process. If you can’t find your password, please contact Spark on 0800 934 348 and have your latest phone account handy for identification. Hopefully they can assist you to reset your password. This entry was posted in How to..., Technology matters by Bunkshyde. Bookmark the permalink.